SmartStraps, a Winston Products’ brand, rolled out a fresh new look for their extensive tie-down product line on October 1st at the Tractor Supply Company. 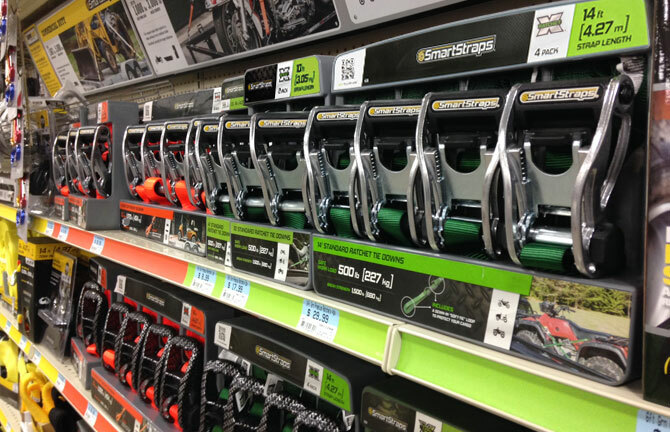 Not only was TSC the first retailer to rollout the new packaging for SmartStraps, but this was the first appearance of the brand on TSC store shelves. It was a big win for Winston Products. The new packaging will be introduced in over 1,200 Tractor Supply Company stores across the U.S. Array Creative has worked closely with the SmartStraps team at Winston Products to refresh the brand, develop the new package design and implement the look across over 170 items in four categories: light duty, standard duty, heavy duty and commercial. Visit your nearest TSC to see the new SmartStraps packaging or visit www.tractorsupply.com to purchase from their line of straps.